College football bowl seasons is one of America’s great holiday traditions. 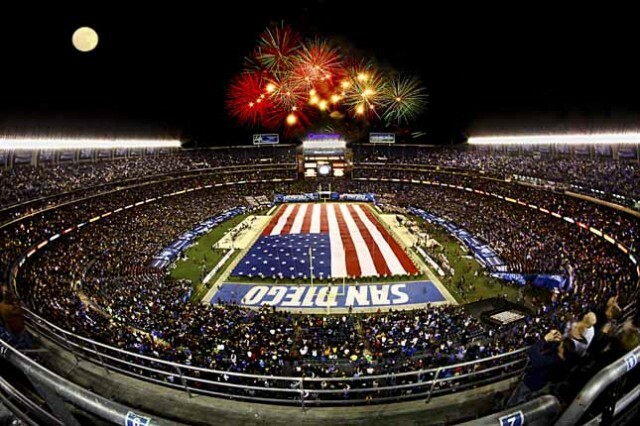 San Diego hosts to two games each December: ‘America’s Most Exciting Bowl Game’, the National University Holiday Bowl, and the San Diego County Credit Union Poinsettia Bowl both call QUALCOMM Stadium home. This year, the games are separated by just 4 days. The Poinsettia Bowl will be played at 6:30 on Dec. 26, and the Holiday Bowl kicks off at 7:15 on Dec. 30. That means a college football junkie could have an ultimate getaway in San Diego. The burning question now is which teams will be invited to enjoy the legendary hospitality rolled out by the San Diego Bowl Game Association, and televised nationally on ESPN. Here’s a preview. This is the most uncertain of all potential matchups. The Poinsettia Bowl will feature teams from the Mountain West Conference, and the Mid-American Conference. The Mountain West’s most likely teams are Utah State, San Diego State, or Boise State. The big question mark is with the MAC, where Northern Illinois, Toledo, Ohio, Buffalo, Ball State, or Bowling Green are all possibilities. If Northern Illinois can win their final two games, they’ll be unbeaten and headed to the BCS. 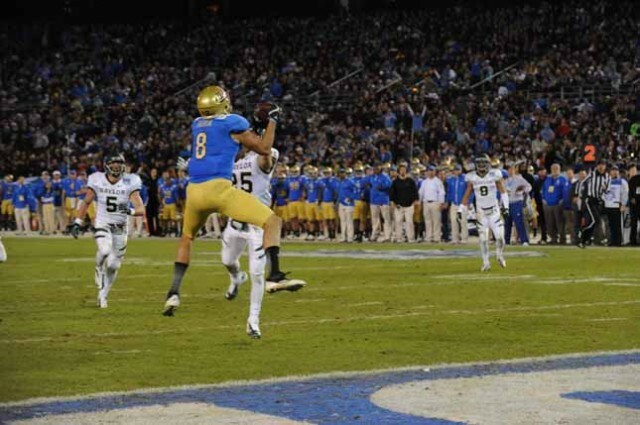 Should the Huskies happen to trip and suffer their first loss, the Poinsettia Bowl would love to welcome them. The Holiday Bowl is in the final year of a contract welcoming Big 12 squads against a Pac-12 foe. Starting in 2014, the Pac-12 will square off against a Big 10 opponent. For the 2013 game, the Big 12’s most likely teams are Texas, Texas Tech, or Kansas State. The Pac-12 would likely be represented by USC, Arizona State, or Stanford. 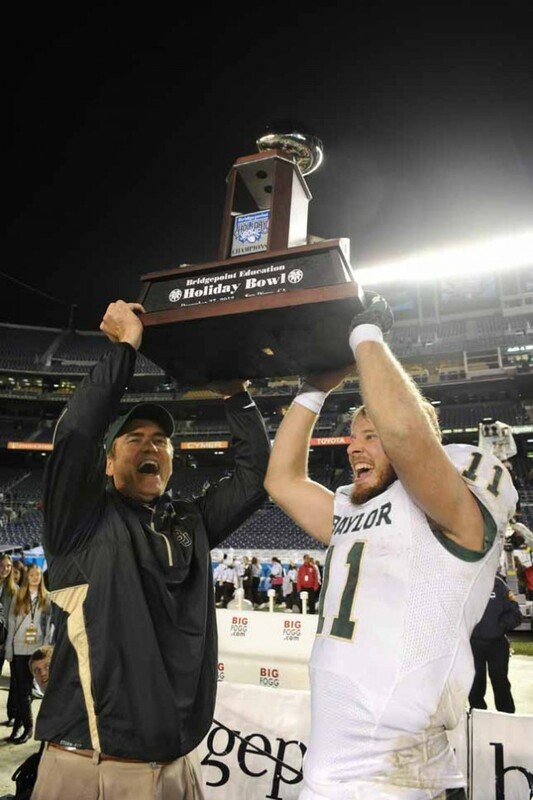 The Baylor Bears won in ’12, who will hold the Holiday Bowl trophy in ’13? Regardless of who is selected, San Diego promises a first-rate pair of games as well as the best series of events anywhere in the bowl landscape. The streets of downtown San Diego will come alive with “America’s Largest Balloon Parade.” The Port of San Diego Big Bay Balloon Parade features marching bands, floats, entertaining drill teams and more giant character balloons than any parade in the country. That’s right, even more than the Macy’s Thanksgiving Day Parade. More than 100,000 streetside spectators will line the one-mile bayfront parade route and join a national television audience. After you open your gifts, load up the football fans, and make your way to San Diego for Bowl Season! This entry was posted in Attractions, Family Vacations, Golf & Sports, San Diego Events and tagged football, holiday bowl, holiday events, poinsettia bowl by Brian. Bookmark the permalink.